Tunisia is the northernmost country in Africa and shares borders with Algeria, Libya, and the Mediterranean Sea. Its culture uniquely embraces Arab, African, and European influences and provides for a provocative study abroad in Tunisia experience. The vast Saharan dunes of Tunisia provide a backdrop for many of its cities and villages which brim with domed buildings, tall archways, and bustling squares. 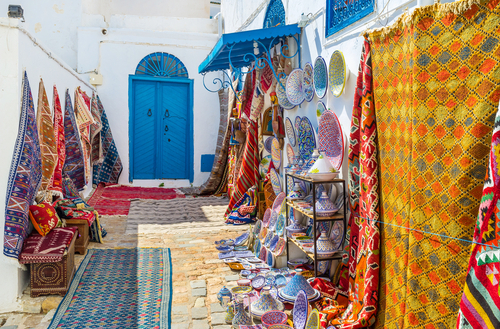 As you explore Tunisia, you’ll notice that the cozy blends with the expansive as narrow streetways widen into expansive squares and quaint stacked homes abut massive buildings. The country’s intriguing environments blend with its fantastic sights—El Djem Amphitheatre, the Grand Erg Oriental, and the village Sidi Bou Said, for example—to allow for a unique stay abroad. Why Study Abroad in Tunisia? You can enjoy much of what Tunisia has to offer through summer, semester, or year-long programs. You may also find opportunities to intern or volunteer abroad. No matter your program-type, you’re likely to enjoy a fantastic adventure in Tunisia while you earn academic credit, enhance your resume, and expand your global perspective. Studying abroad in Tunisia provides a lovely balance between responsible action and expansive adventure. To explore study abroad in Tunisia opportunities, visit our sponsored listings below. There you can find information and contact details for various programs. Once you’ve found a program you like, contact the sponsor directly to learn more and sign up. Then, pack your bags and prepare for the adventure of a lifetime! Experience Tunisia through the lens of classroom and workplace experience! Action AMIDEAST in Tunisia is a unique opportunity for students to learn through a combination of class time and volunteer experience in one of many fields of employment.